The global market for benzyl alcohol has been expanding at a steady pace over the years owing to the consistent demand arising from various end-use industries. The growing applications of benzyl alcohol in the paints and coatings, food and beverages, pharmaceutical, and personal care industries are likely to continue driving the demand for the same over the course of the forecast period. The global benzyl alcohol market was valued at US$198 mn in 2015 and is projected to reach US$299.2 mn by 2024, expanding at a CAGR of 4.7% therein. This highly consolidated market is marked by the presence of multinational manufacturing companies with a strong regional foothold. Retaining a high degree of competition throughout the forecast period, the benzyl alcohol market will present numerous growth opportunities for players in various avenues. Benzyl alcohol plays an important role in a wide range of end-use industries such as personal care, food and beverages, pharmaceutical, and paints and coatings. By application, paints and coatings was the leading end-use segment in the global benzyl alcohol market, constituting more than 60% in 2015. Benzyl alcohol is employed in several applications in the paints and coatings industry. It is used as a solvent for manufacturing paints, inks, and epoxy resins and as a paint stripper in industries such as automotive and aviation. The pharmaceutical sector is estimated to be the fastest growing end-use segment during the forecast period. A significant increase in the usage of benzyl alcohol in the pharmaceutical industries in developing regions is projected to propel this segment in the near future. The global benzyl alcohol market is geographically segmented into North America, Europe, Asia Pacific, Latin America, and the Middle East and Africa. In terms of volume, North America accounted for a share of more than 35% in 2015. The region is estimated to maintain its lead during the forecast period, with the U.S. likely to be one of the prime manufacturers and consumers of benzyl alcohol in the next few years. The growth of the North America market can be attributed to the increased demand for benzyl alcohol from the paints and coatings, pharmaceutical, and personal care industries. However, the benzyl alcohol market is likely to expand at a sluggish rate in North America and Europe over the course of the forecast period. Asia Pacific is anticipated to be the fastest growing regional market for benzyl alcohol. Increased demand for benzyl alcohol in the pharmaceutical and personal care industries is estimated to be the key factor driving the market in the region. This trend is projected to shift the momentum of demand between 2016 and 2024 from the developed markets to developing regions. Key players in the global benzyl alcohol market include Emerald Performance Materials, Lanxess, Pharmco-Aaper, Avantor Performance Materials, Merck KGaA, Alfa Aesar, Finar Limited, Gujarat Alkalies and Chemicals Limited, Elan Chemical Company Inc., Wuhan Youji Industries Co., Ltd., Wuhan Biet Co., Ltd., Hubei Greenhome Fine Chemical Co., Ltd., and Ineos AG. Benzyl alcohol is an aromatic alcohol, which is metabolized into benzoic acid inthe human body. Benzyl alcohol is manufactured by hydrolysis of benzyl chloride in the presence of soda ash through the toluene oxidation process. It can also be produced from benzyl acetate by hydrolysis or by trans esterification with methanol. Benzyl alcohol plays an important role in a wide range of end-user industries such as personal care, food & beverages, pharmaceutical, and paints & coatings. It is extensively used as an intermediate in the production of a large number of chemicals. Increase in usage of personal care products and rise in demand for pharmaceutical products, i.e. excipients, especially in developing regions, are anticipated to boost the benzyl alcohol market during the forecast period. However, toxic effects of benzyl alcohol are expected to hamper market growth. High growth potential in emerging economies is estimated to act as a major opportunity for the benzyl alcohol market in the near future. This report analyzes and forecasts the market for benzyl alcohol at the global and regional level. The market has been forecast based on volume (kilo tons) and revenue (US$ Mn) from 2016 to 2024, considering 2015 as the base year. The study includes drivers and restraints of the global benzyl alcohol market. It also covers the impact of these on the demand for benzyl alcohol during the forecast period. The report also highlights opportunities in the benzyl alcohol market at the global and regional level. The report includes detailed value chain analysis, which provides a comprehensive view of the global benzyl alcohol market. Porter’s Five Forces model for the benzyl alcohol market has also been included to help understand the competitive landscape in the market. The study encompasses market attractiveness analysis, wherein end-users are benchmarked based on their market size, growth rate, and general attractiveness. 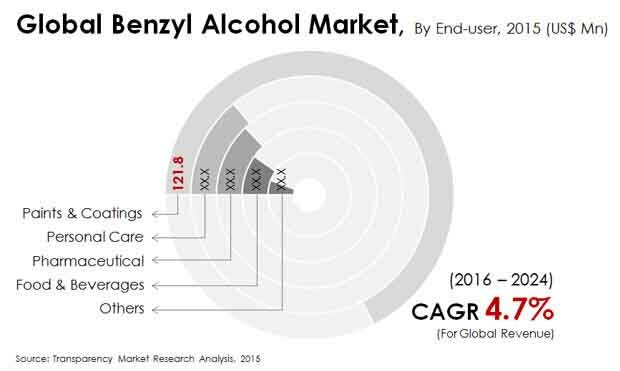 The study provides a decisive view of the global benzyl alcohol market by segmenting it in terms of end-user industries such as personal care, food & beverages, pharmaceutical, paints & coatings, and others. These segments have been analyzed based on the present and future trends. Regional segmentation includes current and forecast demand for benzyl alcohol in North America, Europe, Asia Pacific, Latin America, and Middle East & Africa. The report also covers the demand for benzyl alcohol in individual end-user industries in all the regions. The report provides the estimated market size of benzyl alcohol for 2015 and forecast for the next eight years. The global market size of benzyl alcohol has been provided in terms of volume and revenue. Market volume has been defined in kilo tons, while market revenue is in US$ Mn. Market numbers are estimated based on key end-user industries of benzyl alcohol. Market size and forecast for applications have been provided in terms of global, regional, and country level markets. Secondary research sources that are typically referred to include, but are not limited to company websites, annual reports, financial reports, broker reports, investor presentations, SEC filings, Plastics Wire, The Danish Environmental Protection Agency, internal and external proprietary databases, and relevant patent and regulatory databases such as ICIS, Hoover’s, oneSOURCE, Factiva, and Bloomberg, national government documents, statistical databases, trade journals, market reports, news articles, press releases, and webcasts specific to companies operating in the market. Primary interviews are conducted on an ongoing basis with industry participants and commentators to validate the data and analysis. These help validate and strengthen secondary research findings. These also help develop the analysis team’s expertise and market understanding. The report comprises profiles of major companies operating in the global benzyl alcohol market. Key players profiled in the report include Emerald Performance Materials, Lanxess, Pharmco-Aaper, Avantor Performance Materials, Merck KGaA, Alfa Aesar, Finar Limited, Gujarat Alkalies and Chemicals Limited, Elan Chemical Company Inc., Wuhan Youji Industries Co., Ltd., Wuhan Biet Co., Ltd., Hubei Greenhome Fine Chemical Co., Ltd., and Ineos AG. Market players have been profiled in terms of attributes such as company overview, financial overview, business strategies, and recent developments.